Call us crazy but when it comes to the holidays, we firmly believe that the outside of our house is basically just another opportunity to decorate our spaces just as festively, if not more so, as the inside is! That’s why we’ve become a little bit obsessed with the idea of making awesome pieces and displays that will help our lawn (and also the porch, as well as perhaps the trees) look totally awesome for the holidays. We can’t help wanting to provide the entire street with a little extra cheer when they days are short and the temperatures are low! Just in case you love the idea of making your very own Christmas lawn decor just as much as we do, if not more, here are 15 of the very best designs, ideas, and tutorials that we’ve come across so far. 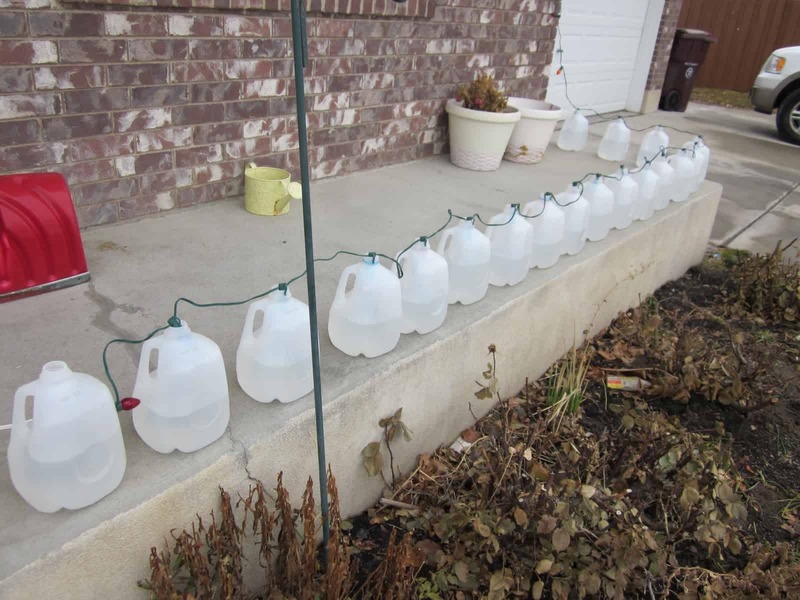 Do you have a yard that’s very far from the street and sidewalk and you find that the Christmas lights you put up each year simply don’t glow as far as you’d like them to so passersby can really see them? Then we have a feeling you’ll get along very well indeed with this fantastic water and milk just trick! Thrifty 101 shows you how the water magnifies the light for a bit more glow. Perhaps we’ve caught your attention with the idea of making things bigger and brighter so they can be seen from the street, but it’s not your lights you’re concerned with? 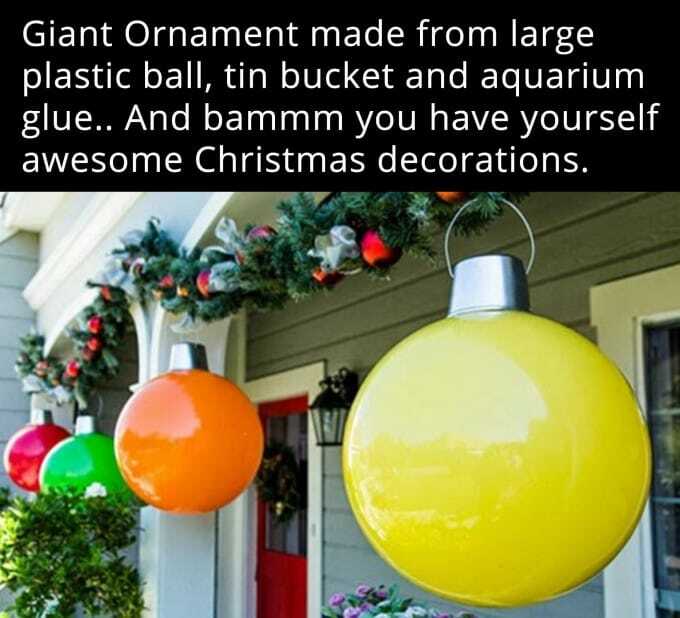 Well, if what you’d really like to make is something in impressive jumbo size, we’d definitely suggest taking a look at how DIY n’ Crafts used plastic toy balls and metal buckets to make DIY jumbo tree ornaments to hang from their porch overhang! We’ve always been huge candy lovers who adore lollipops all year round. There’s just something about having them at Christmas, however, that seems a little extra festive. 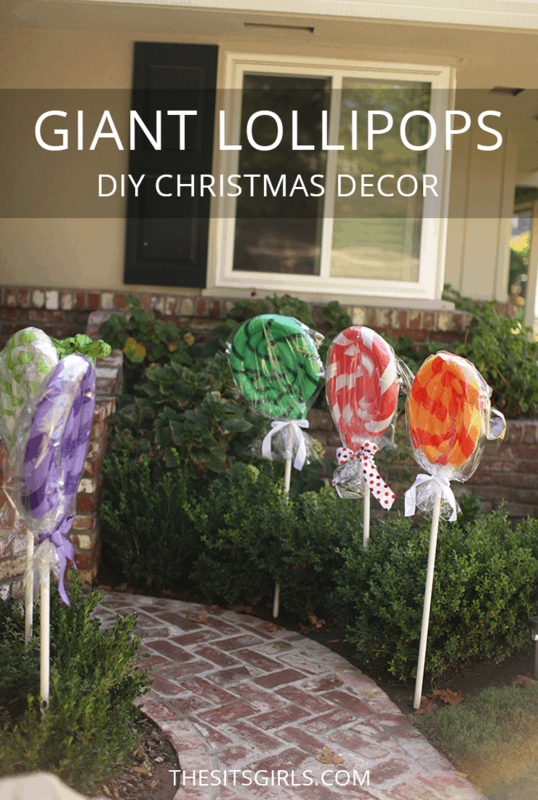 We’re sure you can imagine, then, just how pleased we were when we came across this tutorial from The Seasonal Home that teaches you how to make your very own jumbo lollipops in Christmas colours to stand in your garden! Did we actually really catch your attention with the lollipops idea but you can’t help wishing they were the more classic homemade kind that spiral out from the centre because you’ve always enjoyed eating or making old fashioned peppermint ones around the holidays? Then you’ll find precisely what you’re looking for in this jumbo pathway lollipop tutorial from The Sway! We’ll admit it: sometimes we just really like hanging decorative stuff from the trees in our yard and we’ll use just about any holiday as an excuse, particularly if it’s something we can make ourselves. 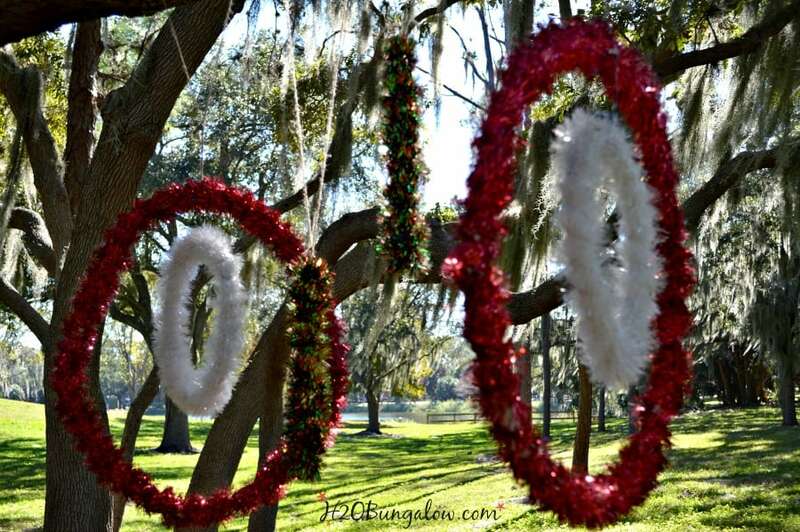 That’s why we loved this bent PVC and tinsel covered tree ornament design from H2O Bungalow so much! The process is also a total blast, if you ask us. Have you actually been hoping to find something a little more rustic and traditional looking than some of the novelty things we’ve shown you so far? In that case, we’d definitely suggest taking a look at how Smart Girls DIY made these lovely painted log Santas that are based on a traditional type of homemade Christmas piece originally haling from Denmark! Just in case you thought we were done with the jumbo lawn decor ideas, here’s one more to keep you going! We’re completely in awe of how simple DIY Cuteness makes it look to create a whole nutcracker from buckets and plastic tubes but we’re also grateful that they outlined their entire process in detail so that we can all follow along and make our own as well. Talk about eye catching! 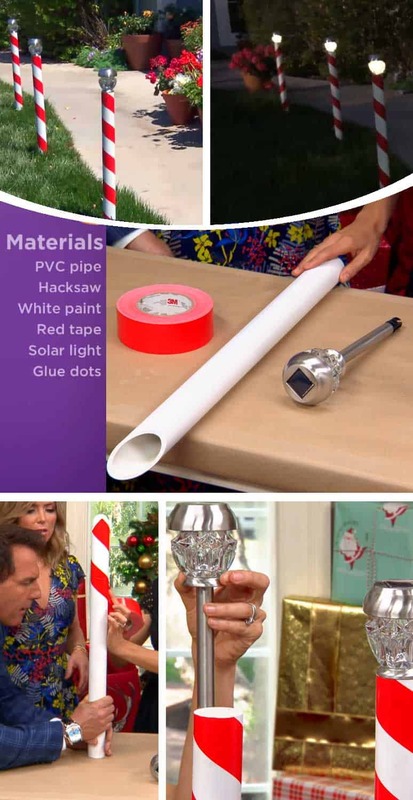 This awesome holiday yard decor is particularly exciting to make because it actually feels a little bit like a science experiment while you’re doing it! 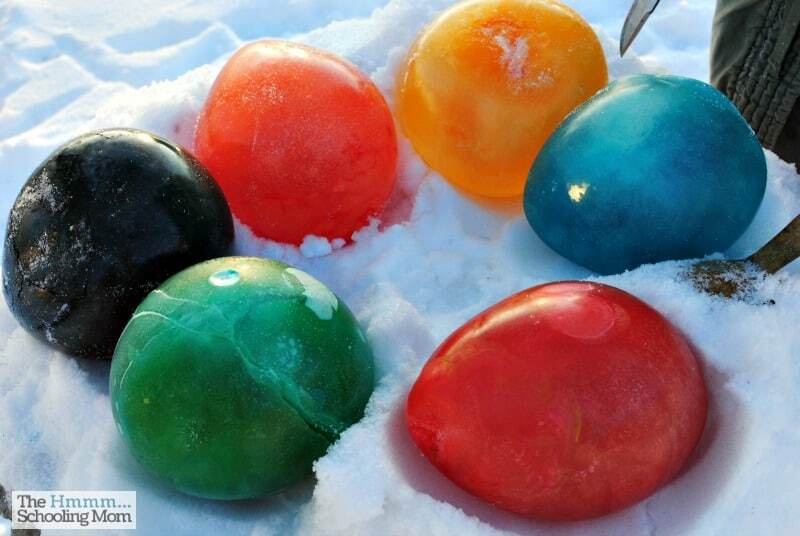 Check out how Chox The Muse made these lovely frozen orbs or giant, colourful ice marbles by filling balloons with water and some colouring and leaving them in the snow until the rubber pops (but be sure to pick up the rubber pieces so it doesn’t make any curious animals sick). 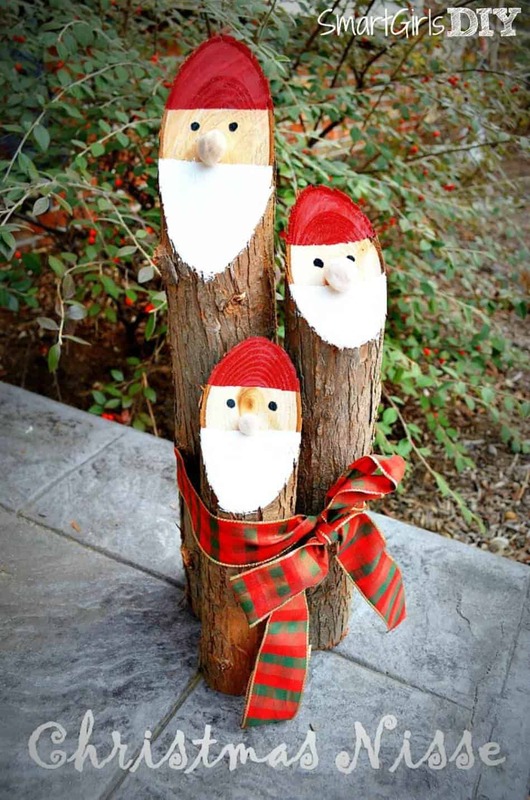 Did we really catch your attention when we started talking about ways to make hands on wooden lawn decor out of wood and branches, even though you already have some Santa pieces and you don’t really need another one? 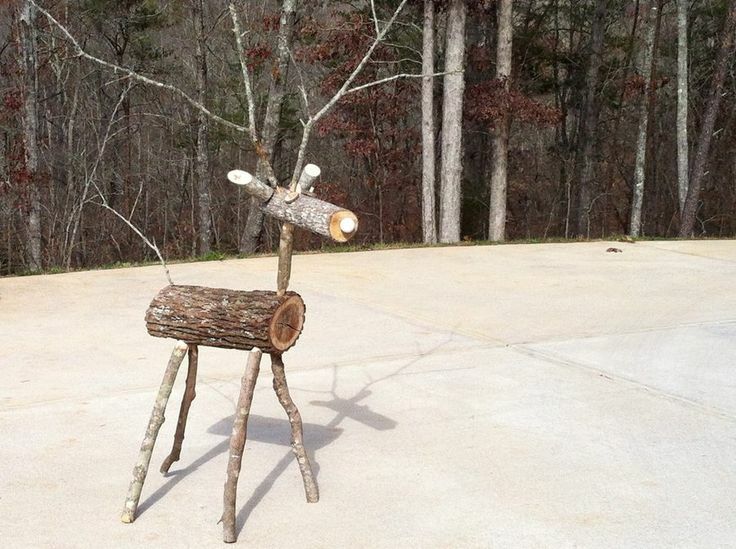 In that case, we’d definitely suggest taking a look at how Mrs Vera made this adorable reindeer from differently sized branches found in their very own yard! Perhaps you were interested in the large colourful orbs but you can’t help thinking you’d like them a little bit more if they lit up, rather than looking cool during the day? In that case, we think you might get along a little bit better with something like these bent wire balls covered in delicate Christmas lights in all different colours! See how they’re made in more detail on Christmas Lights Etc. Perhaps you quite enjoyed the idea of lining your yard’s walkway with a holiday inspired candy but you’re just not sure lollipops are quite Christmassy enough for how you want your yard to look? 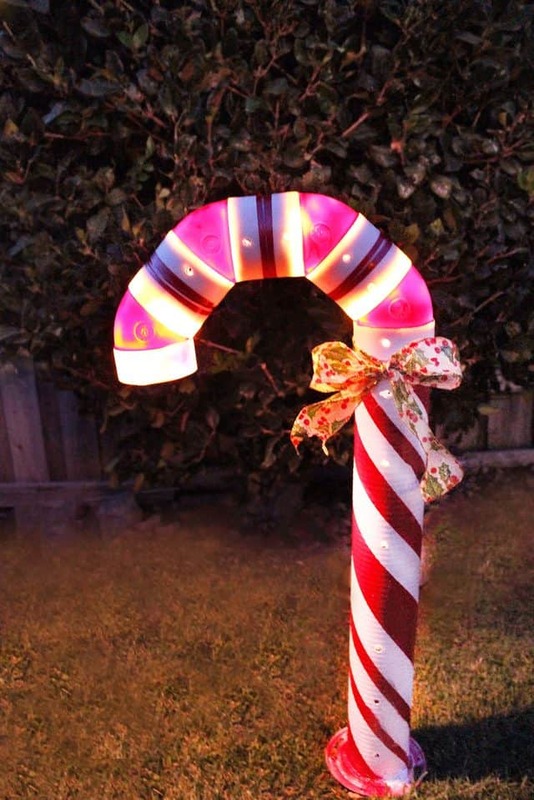 In that case, we’d absolutely suggest taking a look at how DIY Cuteness made these fantastic candy cane stands that are also solar powered lights! Just in case the large sized things you mostly have access to in your yard are a little more industrial inspired rather than rustic and wooden, here’s a tutorial that takes full advantage of things that are a little more heavy duty! Check out how Chica Circle created awesome, jumbo sized Christmas presents by painting and ribbon wrapping cement blocks. Here’s another project that lets you get creative using wood, but in a simpler way than some of what you’ve already seen! Duke Manor Farm guides you step by step through the process of attaching five pieces together once they’ve been painted in order to make a lovely star. 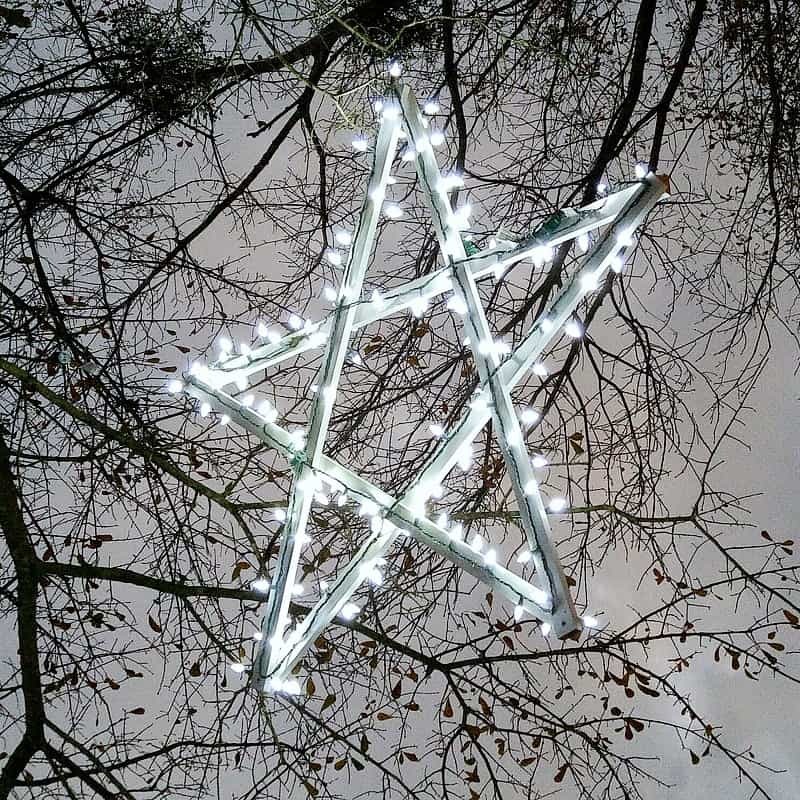 They even show you how to affix lights so it glows from wherever in the yard you hang it! Were you rather intrigued indeed by the candy cane idea but you’re just not sure they look quite right without the signature hooked shape on the top? Well, thanks to E-How, you don’t actually have to leave that part out in order to make a jumbo walkway candy can that lights up! They walk you through the process in full detail. 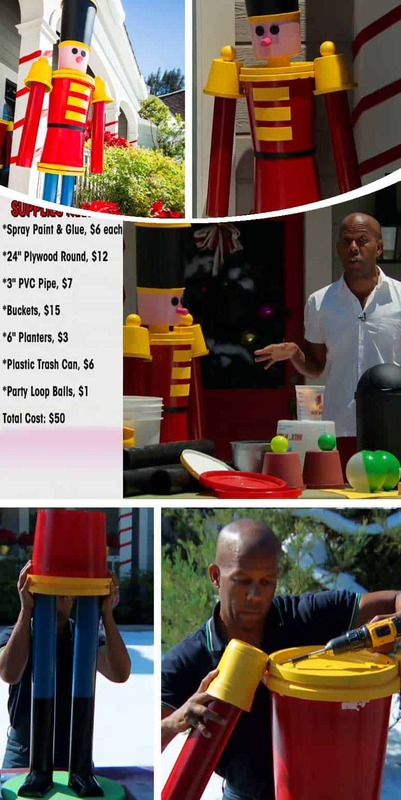 This project from Addicted 2 DIY is yard upcycling at its finest! 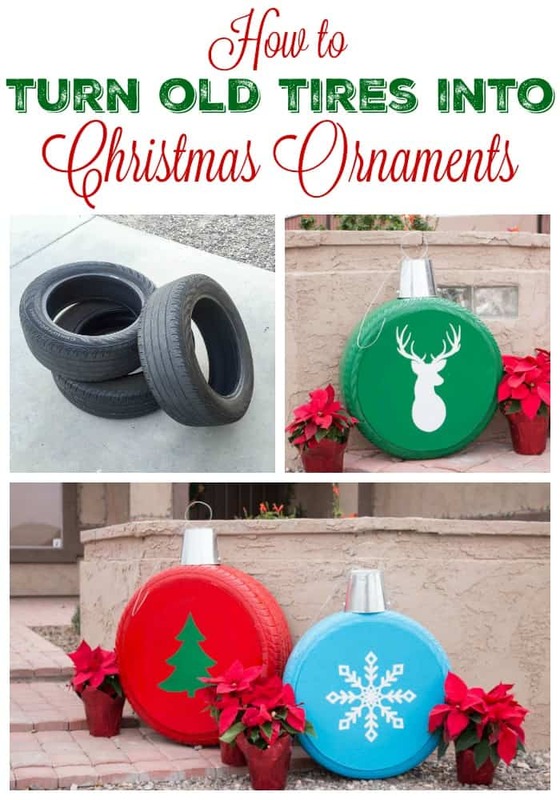 They walk you step by step through the process of painting and embellishing old tires so that, when tipped on their side, they look like giant Christmas ornaments leaned against your porch. A like that the clasps on top are made of buckets from the dollar store! Do you know someone who adores decorating their lawn for their neighbourhood’s delight every season but who could use some inspiration this Christmas? Share this post with them to give them all kinds of awesome things to try!